Areas in the park open at 7 a.m. daily, year round. Crosswicks Creek Park, with Historic Walnford as its centerpiece, is a 2,314-acre park in Upper Freehold Township. Most of the Crosswicks Creek Park forms a narrow corridor of land around Crosswicks Creek. Another 2,700 acres of surrounding farmland is preserved by the county and state Farmland Preservation Program. Crosswicks Creek begins near Fort Dix in Burlington County, travels up the northeast corner of Ocean County, meanders seven miles in Monmouth County, becomes the dividing line between Burlington and Mercer Counties and finally empties into the Delaware River. Hutchinson Road, Allentown. Informal trails (primarily mowed field edges) take visitors through the fields and forest edge of this former horse training track. Rt. 537/Monmouth Road, Cream Ridge. This parking is an access point for paddlers, who will need to carry their canoe/kayak from the lot to the water. 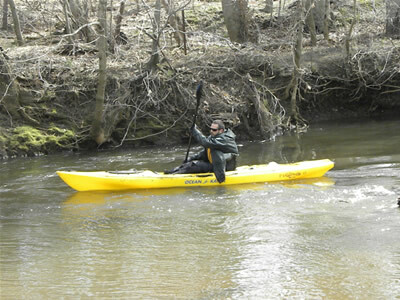 NOTE: Crosswicks Creek has many portages (mostly fallen trees). Province Line Road, Allentown. While this site does not provide access to Crosswicks Creek, it has its own "fishing hole" and some informal trails (primarily mowed field paths). Take I-195 west to exit 16 (Route 537 west) or follow Rt. 537 west from Freehold. Past Holmes Mill Road approx 1/4 mile. Turn right into parking lot for Rt. 537/Monmouth Road lot access. Continue past lot and trun right onto Province Line Road and right into lot for fishing hole access. Continue past lot and turn right onto Hutchinson Road. Lot access is on right after bend in road. Follow I-195 to exit 16 (Route 537 west) and follow as above.